In 1979 the Grosse Pointe Woods-Shores Nationals advanced to Williamsport after traveling 2,000 miles throughout the Midwest and winning ten straight games. At the time the Nationals were only the third team from Michigan to qualify for the Little League World Series. Little League tournament play and the road to the Little League World Series was a lot different in 1979 than it is today. Now there’s pool play, ESPN and ultimately 16 teams make it Williamsport. 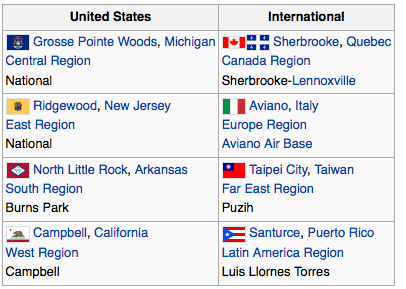 In 1979 only four U.S. teams made it to Williamsport. There was no double elimination or pool play. It was single elimination, if you lost one game you were done. Managed by Bob Rini and coached by Bud Engel and Bill Lindeman, the Nationals began with District 6 play in Harper Woods in late July and emerged as champions over 18 area teams. The District Tournament victories were on the strength of excellent pitching by Dave Waldeck, Mark Bilkovic and Larry Baetens. Waldeck also belted five home runs. The team went on to beat Richmond, District 7 champions in the sectional final. Waldeck pitched a great game and belted two home runs. The sectional victory entitled the team to enter the State Tournament in Gladstone, Michigan in August. Little League World Series – Williamsport, Pa. The Nationals opened the State tournament with a victory against Grand Rapids Pinery Park. Dave Waldeck pitch a no hitter and stuck out 16 hitters. In the State Championship, Birmingham East had the team on the ropes 7-5 in the final inning. The Nationals came back and scored three runs in the final inning. Brian Meulebrouck singled home Larry Baetens to give the Nationals their second straight Michigan State Championship. After the State Tournament the team traveled to Kalamazoo to face Indiana State Champion in the Divisional Tournament. The Nationals beat Anderson, Indiana 7-2 offering a berth into the Central Region tournament in Lemars, Iowa. On August 16 the Nationals played their opening game against Elgin, Illinois. The Elgin team was averaging 10 runs per game. The Nationals stopped that in short order winning 2-0 as Dave Waldeck won his 6th tournament game by pitching a one hitter. The Central Region Championship game was against the Carthage, Missouri. The score was tied 2-2 when the Nationals erupted for four runs in the fifth inning and went on to win 6-2. After ten tournament victories and 2,000 miles of travel the Nationals moved on to the Little League World Series in Williamsport. Four U.S. Regional Champions as well as four International Champions participated in the 1979 World Series which began on August 21. Little League was incorporated in 1939 in Williamsport, Pennsylvania. In 1954 Marvin Boutin spearheaded the effort to bring Little League to Grosse Pointe Woods and Grosse Pointe Park. He brought in needed sponsorship money from the Grosse Pointe Optimist Club, which offered to sponsor both leagues. Once the applications for franchises were obtained, Marvin formed a committee and put his energy entirely into the Woods franchise. According to the “minutes”, 52 men and 1 lady were present at the first official organizational meeting on February 9, 1954. Temporary officers were elected and the following committees, Sponsors, Constitution and by-laws, programs, grounds, equipment, and public relations. A huge informational rally was held February 22, 1954 at Parcells School where 1100 boys and parents attended. The master of ceremonies was the former Detroit Tigers announcer Ty Tyson; also present as speaker was baseball Hall of Famer, Charlie Gehringer. A playing site was provided by the City of Grosse Pointe Woods at the Mack-park later named the “Alois A. Ghesquiere Memorial Park” by the City Council March 15, 1954. The city provided the necessary clearing of land, drainage, field layout of the backstop and field maintenance. The City Council appropriated $1000.00 as an interim measure to get construction of the diamond underway and ready for opening day May 30, 1954. It was decided to include the village of Grosse Pointe Shores in the Franchise application because of their interest yet inability to support their own league due to size. The Shores provided a diamond at the Vernier Rd. site. The league was known at Grosse Pointe Woods Little League until the Fall of 1956 when the Shores name was added. Nearly 300 boys signed up, ages 8-12. Four major league teams were in the American League, eight Minor League teams were in the International, and several weeks after the season began and additional league known as the Pacific was formed with four Minor League teams. There were not enough playing fields, sponsors or coaching staff to have additional teams. Games were played at Ghesquiere and Vernier. Tryout and practices were held at Parcels, Monteith and Mason. Opening Day was on Memorial Weekend May 30, 1954 with an elaborate parade of: Cowboys, Cowgirls, Cub Scouts, Boy Scouts, Girl Scouts, convertibles with civic notables and celebrities such as Ted Lindsay (Captain of the Red Wings). Hot dogs and refreshments ran out in less than two hours. The very first game saw Tigers Pitcher Dave Lowery and battery mate Jerry Phillips get the win 5 to 1 over the Red Sox. The first season had its low points. 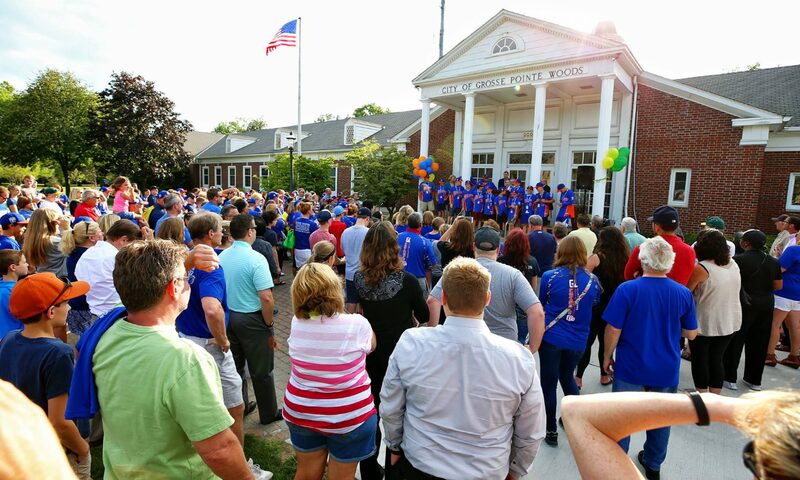 There was a manager forced to step down, an umpire not allowed to perform Grosse Pointe Woods-Shores Little League games because of the use of profanities, protest letters to Little League Headquarters, a long regular season (ending August 1, 1954), and ultimately controversy regarding the Co-Championship. A high point was when Red Sox 12 year old Lars Anderson pitched a perfect game striking out 13 batters in an 8 to 0 win over the Yankees. Also at the end of the season the Detroit Tigers invited each team of 15 players and 3 adults to a game at Briggs Stadium. However the highest point was undoubtedly when a group of selfless men took on the daunting tasks of starting this league from scratch without a playing site, equipment or funding and somehow procured all these needs in such a short time. This became the seeds for a great future interest and growth that would lead to all the success through the years. We salute all the people involved in starting this great league.